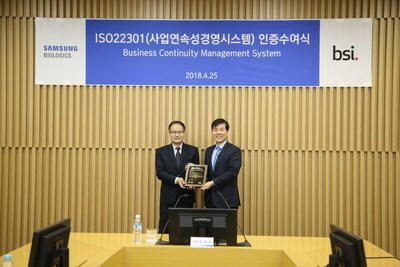 INCHEON, South Korea, April 25, 2018 /PRNewswire/ — Samsung BioLogics, one of the global biologics development and manufacturing companies, announced today that it received ISO 22301 certificate, the international standard Business Continuity Management System (BCMS), from BSI (British Standards Institution), a global certification association. They are the first South Korean company to do so. Tae Han Kim, CEO of Samsung BioLogics, is receiving ISO certificate from Jongho Lee, CEO of BSI Korea. ISO 22301 certificate is a comprehensive standard published by the International Organization for Standardization (ISO) that represents the highest level of commitment to business continuity and disaster preparedness. In the case of biopharmaceuticals, the production and supply of biologics is directly linked to the life of patients suffering from serious diseases including cancer, so it is crucial to stably produce biologics and deliver them accurately. Accordingly, global pharmaceutical companies consider crisis systems critical and request a high level of crisis response system from their partners. Samsung BioLogics launched an internal task force composed of 16 teams and 22 people and discovered a total of 573 projected risks over about two years, reflecting global customer’ needs. Ultimately, Samsung BioLogics established an emergency response scenario by anticipating an internal or external crisis that may happen, which led to the attainment of ISO certification. Furthermore, Samsung has also proved that it is able to maintain the continuity of management in a short period of time in case of an unexpected emergency such as a natural disaster, by pre-setting and preparing resources and time required to overcome the crisis. "Through ISO 22301 certificate, Samsung’s quality management ability will be recognized once again and it will be a great help in order to get additional orders," said TH Kim, CEO of Samsung BioLogics. "Samsung will continue to identify internal and external risks and improve our processes so that we will become a company that leads global standards for crisis response by providing our customers with high service availability and business continuity."